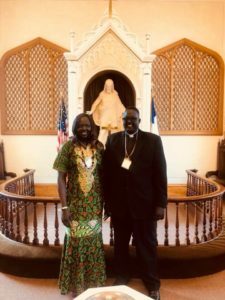 Pastor James Puotyual was born in the Upper Nile region of South Sudan. In 1985, due to civil war, he was forced to move to Ethiopia and Kenya, living for a few years in tents in United Nations refugee camps. While in the refugee camps, Pr. James married his wife, Nyandit Rika in 1987, after which a daughter was born and then died from malaria in 1990. In 1994, he along with his wife Nyandit and son, Jal, came to the United States. Once in the U.S., Pr. James worked at every opportunity to receive an education. James was ordained in 2015. He and Nyandit have two grown children, Jal Dobuol and Nyalat Dobuol. Today, because of continual civil wars in Sudan, there are over 500,000 refugees living near Gambella, Ethiopia. There is a constant need to show Christ’s love to these refugees. Pr. James is being sent to Gambella to serve that need. The primary work for Pr. James will be to provide sacramental worship and spiritual care for the Sudanese living in refugee camps in Ethiopia. He will work in partnership with the Lutheran Church of South Sudan and the Ethiopian Evangelical Church Mekane Yesus (EECMY). Click here for a form to “adopt” Pastor James Puotyual and send direct support.